A Spanish newspaper is reporting Chelsea's Arjen Robben has agreed to terms with Real Madrid for a €20 million transfer. Joining Real Madrid and Juventus, Liverpool now appear interested in Gabriel Heinze as well. The Manchester United and Argentina defender will not make any decisions until after Copa America. Atletico Madrid sign Diego Forlan from Villarreal, reportedly for €21 million. Liverpool target Fernando Torres now looks clear to make the move from Atletico to Anfield. West Ham and Argentina striker Carlos Tevez is waiting until after Copa America 2007 to decide who he will play for next season. David Beckham plays keepy-up with an American football and more. Liverpool midfielder Mohamed Sissoko signs new Liverpool deal. LA Galaxy will unveil David Beckham on 13 July. His first match will possibly be a friendly against Chelsea 21 July. Argentina opens their Copa America 2007 campaign tonight against invited guests the United States. A strong Argentina side are favorites to win the tournament, with arch rivals Brazil fielding a weakened side. In 2004 Brazil's young squad defeated Argentina in the final on penalties, but after a thrashing from Mexico in their opening group match last night, Brazil hardly look likely to defend their title. The U.S. enters the match with a weakened squad as well, without most of their few recognizable players, and are not expected to put up much resistance to the full strength Argentinians. Inter Milan owner Massimo Moratti says his club is no longer interested in West Ham's Carlos Tevez. Fabio Capello is sacked after leading Real Madrid to its first La Liga title since 2003. Copa America 2007 really gets fired up as Chile rally to beat Ecuador and Mexico are brilliant in an historic 2-0 win over Brazil. Copa America 2007 @ Soccer Golazo! Copa America 2007 can be viewed for free, live on the web, through Univision's streaming video feed. The first marquee match-up of Copa America 2007 takes place tonight as Brazil face Mexico. The CONCACAF Gold Cup Final between the U.S. and Mexico draws a much larger audience than NHL Stanley Cup Final. Liverpool is still working on a deal for Atletico Madrid striker Fernando Torres. David Trezeguet signs new deal with Juventus. United States traveling supporters are warned by the U.S. State Department to consider the risks of attending the Copa America. The first semifinal is moved from Caracas to Maracaibo. For a new American television commercial, David Beckham trades in his football kit for American football pads. Thierry Henry is unveiled at Barcelona's Camp Nou. Much to the disappointment of several English Premier League teams, Sevilla striker Frederic Kanoute says he is not planning on moving. Having won two EPL titles and three FA Cups, a Champions League crown was all that was missing from Thierry Henry's Arsenal. But now, as the France international makes a move to Barcelona, one can't help but sense a bit of irony in the whole proceedings. The Gunners were within 14 minutes from hoisting Europe's most prestigious club trophy in 2006, but two late goals sent the trophy to his new club. Interestingly, it was Henry who unable to finish, and on numerous occasions the France international could have put the match out of reach. Barcelona were very fortunate to pick up the trophy that night in Paris, and one moment of brilliance from Henry and it could have been England's 4th place Gunners that were immortalized. Henry might have done well to have remembered that along with his own side, 5th place Liverpool were champions in 2005 and this year's 3rd place Reds were close again. And Barcelona are by no means assured another title in the next few years. The Catalan side went out of this year's Champions League in the first knockout round and collapsed in La Liga to finish 2nd. Now having said that, Henry is obviously a great player. And if he is healthy, Barcelona will surely be threatening to win everything next season. And maybe it's not just about that, and perhaps Henry views the Gunners as going in the wrong direction. Seeing the progress of Manchester United and Liverpool, as well as the constant threat of Chelsea, it would be hard to argue that Arsenal have a tough road ahead of them. And as he turns 30 in August, Henry's time for Champions League glory is definitely starting to run out. But still, it's hard not to think that had Henry tucked that second-half breakaway under Victor Valdes, that Arsenal's all-time leading scorer wouldn't need to go looking for that last elusive trophy in Barcelona. BBC is reporting that Sven-Goran Eriksson will likely accept the Manchester City job if the takeover by Thailand Prime Minister Thaksin Shinawatra materializes. Argentina opens their Copa America 2007 campaign versus the U.S. on June 28. Hosts Venezuela open their Copa America 2007 campaign versus Bolivia on June 26. BBC is reporting Thierry Henry will leave Arsenal for Barcelona. Brazil opens their Copa America 2007 campaign versus Mexico on June 27. Mexico opens their Copa America 2007 campaign versus Brazil on June 27. It is being widely reported that Carlos Tevez' representative Kia Joorabchian has struck a deal with Real Madrid. Tevez led West Ham's late run that kept them in the Premier League. After retiring from international football last year, Juan Roman Riquelme has joined the Argentina national side for Copa America 2007. Sven-Goran Eriksson is offered Manchester City job if takeover goes through. Chelsea join Liverpool, Arsenal, and Manchester United as top seeds for next season's Champions League. Boca Juniors defeat Gremio 2-0 on the night and 5-0 on aggregate to capture their 6th Copa Libertadores title. Authorities are concerned there may be fan violence at the Copa Libertadores Finals second leg in Porto Alegre Wednesday night. Francesco Totti wins European Golden Boot with 26 to Van Nistelrooy's 25. In a dramatic finish in La Liga, Real Madrid win the title with two late goals for a 3-1 victory at the Bernabeu. 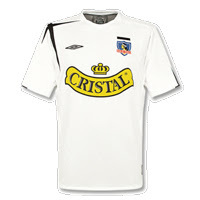 Colo Colo wins its record 26th Chilean title. BBC is reporting, via The Sun, that Shaun Wright-Phillips might be moving to West Ham from Chelsea, alleging the Blues are taking offers. David Beckham's ankle is recovered and he will play in Real Madrid's last match of the season that will decide La Liga's champions. John Terry, Steven Gerrard, Gary Neville, and Michael Carrick, all marry their girlfriends this weekend. David Beckham is told he can keep his place on the national team by England manager Steve McClaren. Sam Allardyce claims that Chelsea will sign Bolton's Ben Haim. Real Madrid can make it simple by winning and claiming La Liga title, but there are a host of other possibilities. Boca Juniors have one hand on the Copa Libertadores trophy as they blanked 10-man Gremio 3-0 in the first leg at La Bombonera. And just like the semifinals, it was a Juan Roman Riquelme free kick that got things started. The playmaker's cross found Martin Palermo open on the back post. Palermo crossed to an open Rodrigo Palacio and it was 1-0 in the 18th. Replays did show the goal offside, but the goal stood. There would however, be no arguing Boca's dominance, particularly in the second half. It was all Boca, and became more so when Goiano was sent off for a reckless high boot. After a series of gilt-edged chances for Palacio, one cleared off the line, Riquelme finally made Boca's advantage pay in the 73rd and neatly fired a free-kick near post after the wall had moved. In the 89th, only seconds after Gremio had just missed one of their few chances, Riquelme dribbled through a handful of defenders and fired a rocket that was parried to the corner, but not out. The ensuing high cross into the box was headed by Ledesma high towards goal. Two Gremio defenders were unable to clear it off the line and the ball dropped in off Patricio for an own goal. Boca will takes its 3-0 lead to Porto Alegre knowing their 6th Copa Libertadores title is there for the taking. The above article was corrected. The original text stated the away goals rule was in effect, but the away goals rule does not apply in the Copa Libertadores Finals. AP BUENOS AIRES, Argentina: Rodrigo Palacio, Pablo Ledesma and Juan Roman Riquelme scored as Boca Juniors pounded Brazil's Gremio 3-0 for the early lead in ..
Robinho had been cleared by FIFA to play in Real Madrid's final match that will decide La Liga title. He will join Brazil late for the Copa America.